Perfect for small runs, digital printing is a great alternative to offset printing because of its fast turnaround, versatility and cost effectiveness. There are no minimum quantities to order, and the whole process can typically be completed within 24 hours, sometimes while you wait. We’re not kidding. Upload your artwork in the morning and pick up the finished product on the way home. Our total solution for color production printing — we’ve combined high-speed output with spectacular image quality to offer the printing efficiency that design studios and busy office environments demand. Could it be any easier? Whether it is stationery or brochures, booklets or newsletters, Brandes’ finished product is of superior quality. Regardless of volume, our staff can execute just a few copies of a file or several hundred, within your time frame and in your budget. 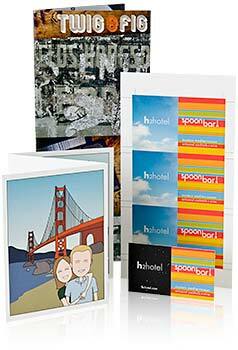 Digital printing streamlines and shortens the printing process. Our state-of-the-art digital capability lets you drop off your artwork in the morning and pick up the finished product on the way home. With virtually no set-up time or waste, digital printing is perfect choice for small booklets, customized invitations or personalized promotional materials. What you want, when you want it. Our digital press can print, trim and stitch up to a 36-page booklet in less time than it takes to eat lunch. Add a few extra finishing touches and you’ve got a piece to be proud of. Call us early in your design so we can help you plan and produce your project and exceed your expectations.